Mutations of the mitochondrial citrate carrier (CIC) SLC25A1 cause combined d-2- and l-2-hydroxyglutaric aciduria (dl-2HGA; OMIM #615182), a neurometabolic disorder characterized by developmental delay, hypotonia, and seizures. Here, we describe the female child of consanguineous parents who presented neonatally with lactic acidosis, periventricular frontal lobe cysts, facial dysmorphism, recurrent apneic episodes, and deficient complex IV (cytochrome c oxidase) activity in skeletal muscle. Exome sequencing revealed a homozygous SLC25A1 missense mutation [NM_005984.4: c.593G>A; p.(Arg198His)] of a ubiquitously conserved arginine residue putatively situated within the substrate-binding site I of CIC. Retrospective review of the patient’s organic acids confirmed the d- and l-2-hydroxyglutaric aciduria typical of dl-2HGA to be present, although this was not appreciated on initial presentation. Cultured patient skin fibroblasts showed reduced survival in culture, diminished mitochondrial spare respiratory capacity, increased glycolytic flux, and normal mitochondrial bulk, inner membrane potential, and network morphology. Neither cell survival nor cellular respiratory parameters were improved by citrate supplementation, although oral citrate supplementation did coincide with amelioration of lactic acidosis and apneic attacks in the patient. This is the fifth clinical report of CIC deficiency to date. The clinical features in our patient suggest that this disorder, which can potentially be recognized either by molecular means or based on its characteristic organic aciduria, should be considered in the differential diagnosis of pyruvate dehydrogenase deficiency and respiratory chain disorders. One-Sentence Summary A novel homozygous missense substitution in SLC25A1 was identified in a neonate presenting with lactic acidosis, intracerebral cysts, and an apparent mitochondrial complex IV defect in muscle. The online version of this chapter (doi: 10.1007/8904_2016_536) contains supplementary material, which is available to authorized users. The authors gratefully acknowledge the contribution of the proband and her family, without whose participation this work could not be undertaken. All authors contributed to the conception and design of the study. 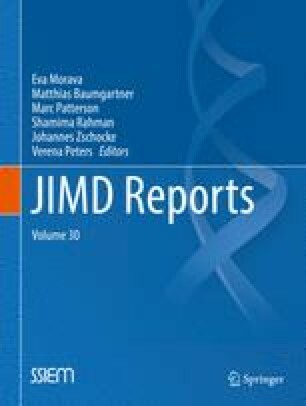 JLM, JeM, OA, PC, and ML acquired the clinical, biochemical, and pathological data. SM produced primary experimental data. Data were analyzed and interpreted by AS, SM, JeM, OA, JS, JaM, DB, and ML. The manuscript was drafted by AS, SM, and ML. Critical revisions were performed by all authors. Amanda Smith declares she has no conflict of interest. Skye McBride declares she has no conflict of interest. Julien Marcadier declares he has no conflict of interest. Jean Michaud declares he has no conflict of interest. Osama Y. Al-Dirbashi declares he has no conflict of interest. Jeremy Schwartzentruber declares he has no conflict of interest. Chandree Beaulieu declares she has no conflict of interest. Sherri L. Katz declares she has no conflict of interest. Jacek Majewski declares he has no conflict of interest. Dennis E. Bulman declares he has no conflict of interest. Michael T. Geraghty declares he has no conflict of interest. Mary-Ellen Harper declares she has no conflict of interest. Pranesh Chakraborty declares he has no conflict of interest. Matthew A. Lines declares he has no conflict of interest. All procedures followed were in accordance with the Tri-Council Policy Statement: Ethical Conduct for Research Involving Humans (2010) and with the Helsinki Declaration of 1975, as revised in 2000. Informed consent was obtained from all patients participating in the study. The research protocol was approved by the Children’s Hospital of Eastern Ontario Research Ethics Board.